How easy is it to adjust to life after MSF? Sure, I had a great time in Europe, but there was also a darker side that the Facebook album somehow doesn't show. The feeling of emptiness, of panic about the future and of lack of purpose in those few days off I was granted. There was nothing I had to do, nothing I had to get up for and no one who needed me. In the Médecins Sans Frontières/Doctors Without Borders (MSF) project I work in, it's the opposite. My to-do list is never shorter than four A4 pages - and strange noises, unexpected incidents or visitors often give me a reason to get up way earlier than the 6am alarm. Most days I'm awake and ready to go at 4.30am. Plus, people need me. All the time. My office door should be a rotating one, the number of people who come in and out every few minutes. The other week, I was visited by five different people while trying to type out one single sentence in an email. I love the sense that I am being useful and I am necessary. Sure, I'm easily replaced by any other project coordinator as soon as my mission ends or I go on leave, but for those seven days a week for those few months, while I am in a project with responsibilities and a title, I am a somebody - and I have a cause. It's either one or the other, never both: either work and a purpose, or time with life-long friends and family. It's never work in the day and family and friends at weekends and evenings. You also spend your time seeing other people your age with proper jobs, grown-up homes and families; panic starts to set in about your own future. I genuinely started questioning the meaning of life and my own reason for being. "I really want to relate, but its becoming harder to"
"[As time goes by] you have fewer and fewer things left in common with your friends and family: 'I got a great bargain in Debenhams the other day- new curtains for half the price.'" Trapped in a world of to-ing and fro-ing, no solid base, and a network of family and friends from whose contact lists you gradually drop as you have less and less time to spend with them and when you do, you have fewer and fewer things left in common: "I got a great bargain in Debenhams the other day- new curtains for half the price." I really want to be able to relate, but it's becoming harder to. I think about the people we work with who have very few worldly possessions and barely, if any, access to clean drinking water. And I really don't want to be that person who trivialises other people's lives and problems or makes their reality seem less important than anyone else's as it's not - they're just different and a reflection of how unequal the world is. I also tried the life of home-decor and Ikea trips a couple of years ago and I loved it. I too got a great bargain at DFS on a mocha (yes, not just "brown") sofa (30 percent off in the Winter sale!) and was entirely drawn into and enthusiastic about discussions of what Mable down the street said last week to the neighbour; but at some point the world of MSF started calling again and it was time to go. 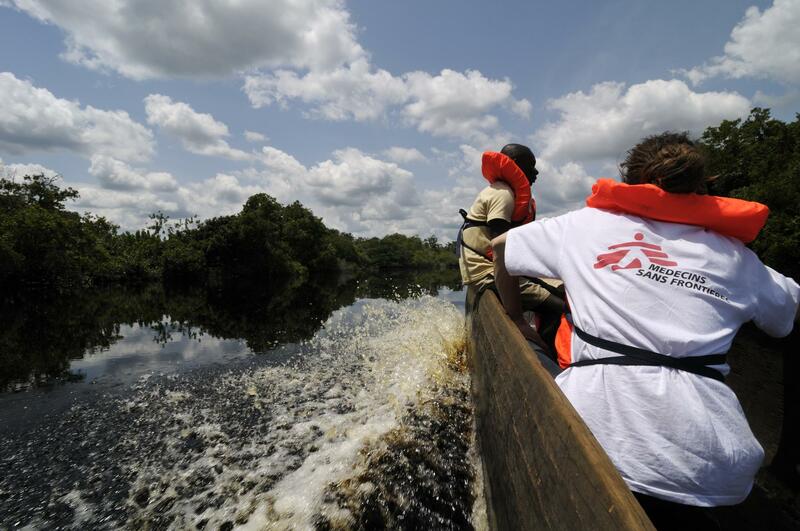 An MSF member of staff looks out across the landscape, DRC. A few years ago I was quite happy to leave and be thrown back into a project, with often strong, but transient friendships, where discussions are instead about the national politics, the latest mystery patient case in the hospital and, well, poop. I can also tell I'm becoming alien to people at home. When I first started this work and people would ask me when I went home, "How was it? ", I used to try to go into streams of detail about what life in the project was like, movements of armed groups, patients etc. I soon learnt, however, that actually what I thought was massively interesting to people was actually too far removed from their reality for them to want to hear more than a couple of sentences. After years of trying to force the cause, apart from the exceptions, I now usually settle for "yeh, it was good". Emily hard at work in DRC. There aren't so many options for "generalist" project managers in the humanitarian world when they want to reintegrate back home. Emily and an MSF Land Cruiser in DRC. I love my job and I love MSF, and I hope it stays a part of my life for many years to come, just sometimes I wish it would be part of my life in a form more like a cousin, or a neighbour, rather than a controlling mother who takes over every aspect of my daily living (and sleeping). Someone that you can pop in and see for a nice wholesome chat over a home-made roast dinner at a time that suits you, as opposed to someone who wants a say in every tiny little thing that you do. In the project, as a coordinator, I have to have my radio with me and be available 24/7. I can't even go to the bathroom in peace. Emily raises the MSF flag at our mobile clinic in DRC. As there was another member of the international staff outside, who I knew could deal with security issues, I chose to get dressed and joined the team a few minutes later when the commotion had calmed down and turned out to be nothing to worry about. This is part of normal life in MSF and normal life as a project coordinator: permanently on-call and permanently ready to respond to whatever need arises next. As I said though, I do love it, but I'm hoping one day I can find a balance between doing this work that I love and also having a strong network of friends and family, and a stable home where I am allowed to go outside after 6pm to just about wherever I want.